P-85YC Hydraulic Cutters: Izumi Products. 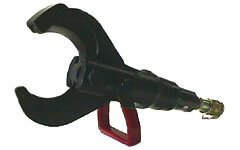 The P-85YC scissors type cutter head was designed to cut various cables used in the industry today. It can cut Cu and Al cables up to 60mm and CCP cables up to 85mm. The scissors type cutter head provides exceptional ease of use and maneuverability when making many cuts. It can cut the cables with a minimum amount of distortion. The P-85YC remote head requires an external, high pressure, 700 bar or 10,000 PSI pumping source.